Following the Great Recession there was an apparent divergence in employment recovery rates between urban centers and smaller cities, according to the authors of a recently published discussion paper. Larger metropolitan statistical areas were experiencing more robust job growth than smaller ones. Analysis of Current Employment Statistics Total Nonfarm Employment data for Idaho, Oregon and Washington – each dominated by one large metro area – conform, demonstrating better employment growth in the dominate metro area compared to the other smaller cities and the states overall. Nationally, most metropolitan areas experienced declines in jobs from peak to trough through 2007 to 2010. Ryan Howley, a U.S. Bureau of Labor Statistics economist now at the Bureau of Economic Analysis, and Toby Paterson, a Washington State Employment Security Department economist point out in their June 2013 paper “Employment Recovery in Urban Areas following the Great Recession” that in the recovery period following the Great Recession trough, a pattern of steady but geographically uneven recovery emerged with larger urban centers experiencing higher job growth than medium and small areas. Idaho, Oregon and Washington all experienced historic nonfarm job losses during the Great Recession. By January 2010, Idaho had lost 56,600 jobs. This 8.6 percent loss was the largest percentage decline of the three states despite Idaho having the smallest labor force. Three years later, Idaho has recovered 68.9 percent of those jobs statewide. 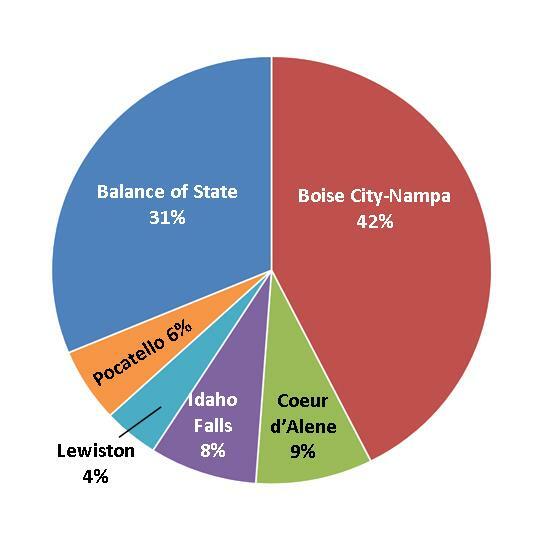 Sixty-nine percent of Idaho’s jobs are in five metropolitan areas – Boise, Coeur d’Alene, Idaho Falls, Lewiston and Pocatello. The Boise metro area is the largest with 265,800 jobs, over 40 percent of the state total and a third more than the other four metro areas combined. These four smaller metros each have fewer than 60,000 jobs and fall into the small metropolitan statistical area category. Together they account for about 170,000 jobs. Boise metro area’s recovery has been faster than the other four and the state overall. 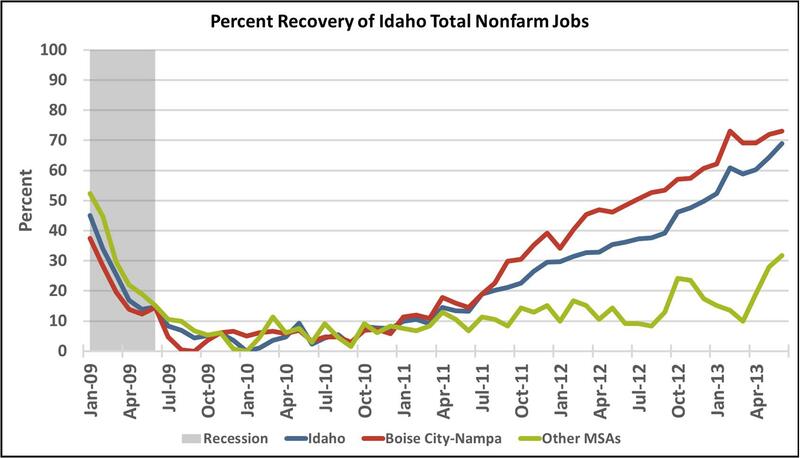 By March 2012 Boise had recovered 45.5 percent of its lost jobs and climbed to 60 percent by mid-2013. In contrast, the other four metro areas had a combined job recovery of just 15.2 percent by March 2012, doubling to over 31 percent by mid-2013. Three of the four smaller metro areas have struggled to gain traction in the recovery. Idaho Falls appears to be an exception, likely because of its unique resource in the Idaho National Laboratory. The INL contributes to a high average annual wage, large employment and is the catalyst for creating economic benefits from spin-off companies locating in the area, providing the Idaho Falls metro area with disposable income and subsequent employment for thousands of indirect and induced jobs. For every job at INL, two more jobs are created or sustained throughout the region, making the INL the source of 25 percent of the region’s jobs. While not immune to the impacts of the Great Recession, metropolitan Idaho Falls possesses economic strength and potential for employment growth through the INL that sets it apart from the other three urban areas. With the removal of the 50,000 jobs in metro Idaho Falls, the other three areas combined had a recovery rate of just 8 percent through March 2012. Other labor market variables for Idaho’s metro areas underscore the disparate job growth between the Boise and Idaho Falls metro areas and the other three. On an annual basis, Idaho’s unadjusted unemployment rate climbed from 3 percent in 2007 to peak at 8.7 percent in 2010. As the recovery began, unemployment fell statewide and by the end of 2012 had improved to an annual average of 7.1 percent. At the time the recession officially began, the Boise City-Nampa MSA unemployment rate began to outpace the other MSAs combined rate. But by March 2011, the Boise City-Nampa MSA rate began to decrease quicker than the combined rate of the other MSAs. In early 2010, the state overall and the five urban areas began to see positive year-over-year labor force increases. But the smaller metro areas – even Idaho Falls MSA, which had seen high year-over-year labor force growth – began to slow by the middle of 2012. Metropolitan Boise was the exception and by 2013 was the only metro area with consistent year-over-year growth since recovery began in 2010. Census Bureau population estimates explain some of this recovery pattern. Idaho’s population grew by 1.8 percent from 2010 to 2012, and that growth was reflected in an increased labor force. By categorizing Idaho’s 44 counties into small, medium and large, the population estimates show that over half of the growth occurred in the four Idaho counties with 100,000 or more people. Breaking down the estimate into natural growth – births over deaths – and net migration revealed that while all Idaho counties saw positive natural growth, medium-size counties of 25,000 to 99,999 people had the highest percentage increase. International and domestic migration patterns showed that while the large counties had a net migration increase, the medium and smaller counties suffered a net loss. The migration pattern for the state appears to move from the smaller counties to the larger counties, contributing to the economic expansion of large counties. Idaho’s recovery didn’t begin in earnest until late 2011 to early 2012. Through 2010 and much of 2011, the steady but geographically uneven recovery saw either minimal growth or a holding pattern across the state’s smaller metro and rural areas. For metropolitan Boise, the migration of population and jobs appears to have helped develop a more pronounced recovery. This pattern is consistent with Idaho’s two northwestern neighbors, Oregon and Washington, and is revealing itself at the national level. The pattern is evident though the reasons warrant further investigation. The population growth pattern seems concurrent with the job benchmark and estimates provided by U.S. Bureau of Labor Statistics. A continuation of this pattern may indicate the early stages of an economic restructuring for the state of Idaho that witnesses an increased economic role for and dominance of metropolitan Boise. Notes: Special thanks to Ryan Howley, economist, U.S. Bureau of Labor Statistics, Washington, D.C. The discussion paper, “Employment Recovery in Urban Areas following the Great Recession,” was published by the Washington Employment Security Department. This entry was posted in Employment News and tagged Boise, idaho department of labor, job growth, recession on October 1, 2013 by Idaho Department of Labor.